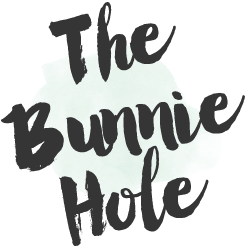 TheBunnieHole | Vancouver Youtuber & Blogger: Review: Philosophy | Micro-Delivery Overnight Peels...as you sleep! 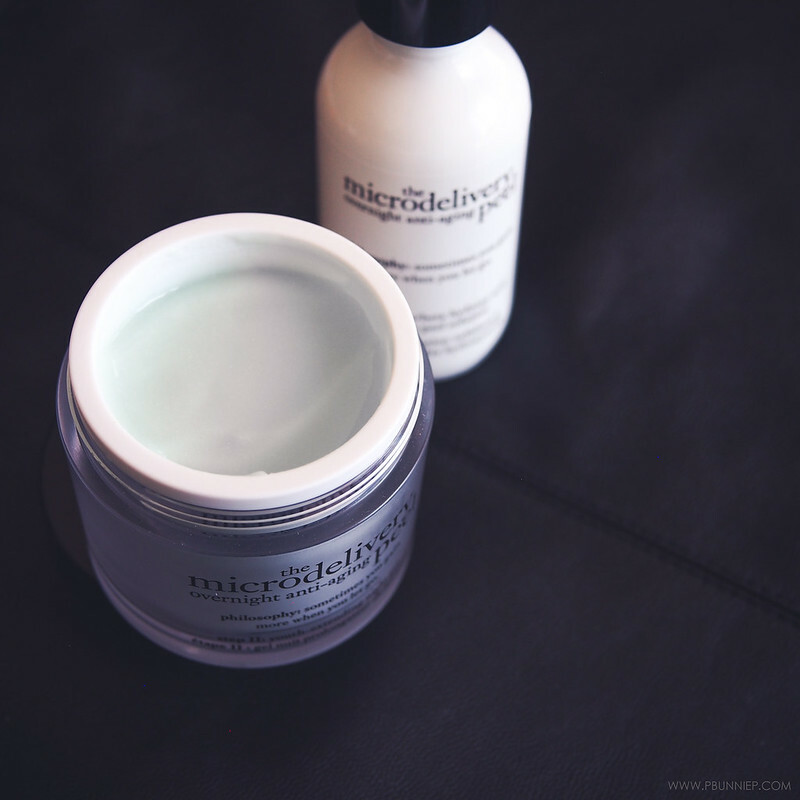 Review: Philosophy | Micro-Delivery Overnight Peels...as you sleep! If your daily sleep time is just about sleep... well, you are missing out. Though I adore my sleeping masks for a little extra TLC, I've recently been trying out an overnight peel that's redefining my beauty sleep. 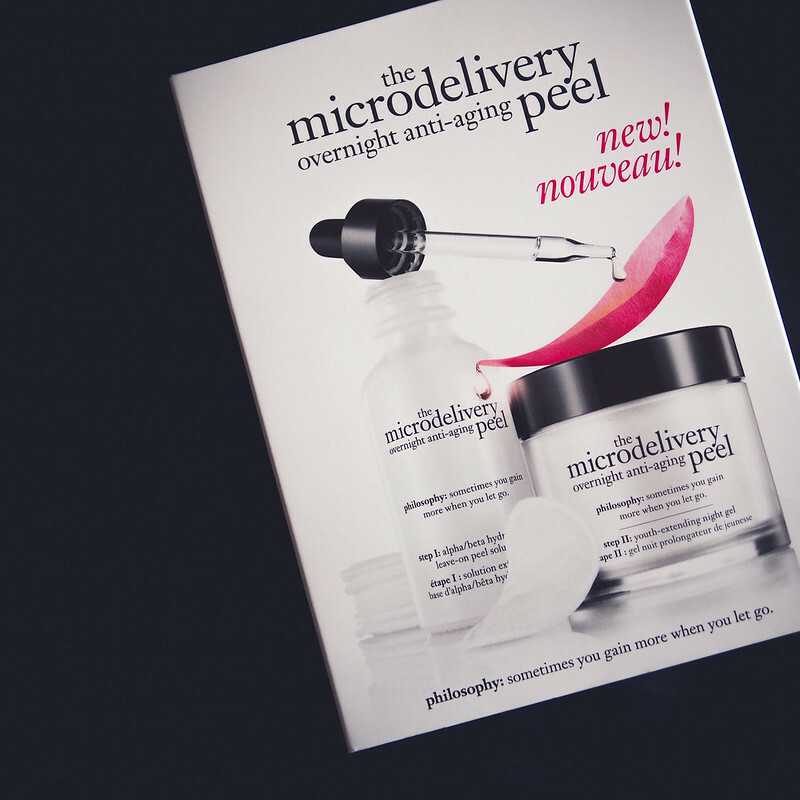 If you've been a fan of Philosophy's exfoliating products, their latest Micro-Delivery Overnight Peel* is certainly worth a peep. Let me start off by saying I am so glad I decided to give Philosophy a second chance after a not so smooth experience (quite literally) with their Hope in a Jar series. A friend of mine told me I had it all wrong and that Philosphy's cornerstone are their amazing exfoliators so this time around I went straight for the gold. 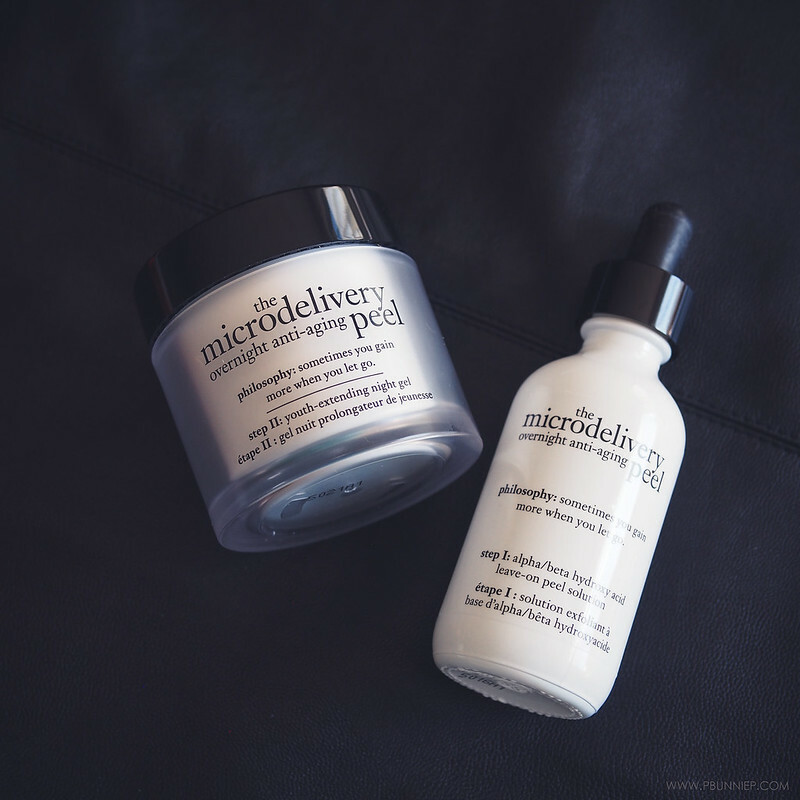 The Micro-Delivery Overnight Anti-Aging Peel is a two step coordinating alpha/beta hydroxy acid solution paired with an youth-extending gel or what I see as a restorative mask. The boxed set comes with both products in a generous size (as you do not need very much product at all) along with a stash of high quality cotton rounds. With clean skin, I take about half to a full dropper of solution onto the cotton and give my face a thorough wipe down making sure not to miss the hairline and around the jaw. Next, a dime sized dallop of gel is warmed up between my fingers and I apply that all over as well. All this hard work takes about 3 minutes and both products have a very mild scent which doesn't disrupt my sleep. Ingredients: Alpha/beta hydroxy acid leave-on peel solution - aqua/water/eau, propylene glycol, glycolic acid, glycereth-7 trimethyl ether, propanediol, alcohol denat., lactic acid, sodium hydroxide, phenoxyethanol, salicylic acid, polysorbate 20, vanillyl butyl ether. Ingredients: Youth-extending night gel - aqua/water/eau, cyclopentasiloxane, butylene glycol, glycerin, propylene glycol, peg-240/hdi copolymer bis-decyltetradeceth-20 ether, acrylates crosspolymer, betaine, dimethicone, aluminum starch octenylsuccinate, phenoxyethanol, polysorbate 20, cetearyl olivate, butyrospermum parkii (shea) butter, sorbitan olivate, parfum/fragrance, dimethiconol, echinacea purpurea extract, bisabolol, acrylates/c10-30 alkyl acrylate crosspolymer, disodium edta, adenosine, sodium hydroxide, benzyl salicylate, hexyl cinnamal, carbomer, avena sativa (oat) kernel extract, potassium sorbate, tocopherol, alpha isomethyl ionone, zingiber officinale (ginger) root extract, farnesol, palmitoyl tripeptide-1, palmitoyl tetrapeptide-7, citric acid, fd&c blue no. 1 (ci 42090). The best part comes the next morning when my skin just glows! My large pores are visibly minimized around my cheeks, my forehead texture is less prominent, my skin is plump and hydrated yet totally smooth. Yes there are some fantastic night creams out there but a peel is a peel and this duo really brings results. Better yet, it is unbelievably gentle and I didn't experience any stinging, redness or irritation which just redefined my archaic notions of what a peel is supposed to be. I've used this quite a few times already and the results are consistent every time. Judging by my own usage, I'm gauging each set should last you around 25 treatments (if not more) and dividing that by twice a week means about 3 months of product if you were to use this religiously. 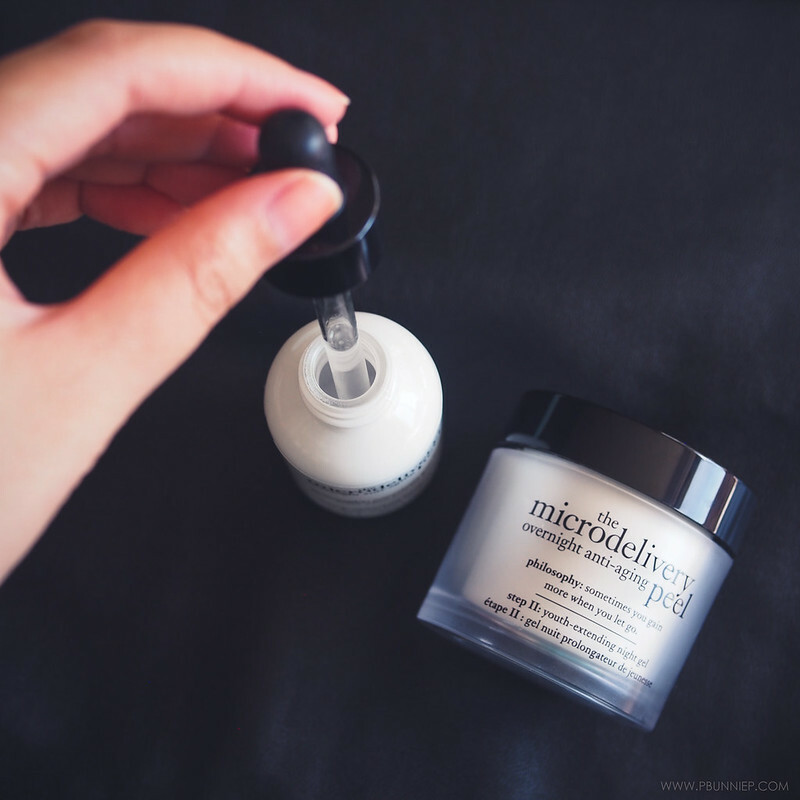 Philosophy's Micro Delivery Overnight Peel is a real gem that balances effectiveness with gentleness all while you sleep. I think the dual-phased product compliments each other very well and fills in the gap of what people are missing between exfoliation and hydration. If you've been scared of chemical peel products before I highly recommend testing out this version and of course do a patch test on the arm/neck if it's your very first time. I also think this is a great anti-aging starter kit for those who want something to ease themselves into the category. 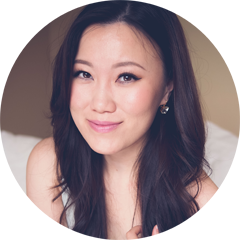 While I've had good results using glycolic products for exfoliation, this Philosophy set stands out as a weekly treatment that provides overnight results so you don't have to be a slave to a routine. Use it when you need it and get back to life.